Onida, once a dominant player in CRT TV segment, recently launched a trio of Google Certified Android Smart TVs in India. They boast of a pure Android experience, pre-installed Google Play store and built-in Chromecast support to wirelessly cast content from compatible apps on your smartphone or tablet to the TV. We got the 43-inch variant for review. Let’s dive deeper and check if it is indeed the owner’s pride. Let's start with the most important aspect of any TV — the picture quality. How good does the picture look on this TV? The answer — depends on the resolution of the source file that you watch. Let me explain. This is an Ultra HD panel, so if you choose to watch 4K content on it, it looks very good. As the resolution of the source file drops, the quality starts to drop noticeably. Anything with up to full HD (1080p) resolution still looks good on this TV, but anything lower starts to look washed out. Even our 720p test videos that look pretty good on some other 43-inch TVs that I have tested before, looked dull on this screen. As weird as it may sound, this is a problem with having an extremely high-resolution display. Contrary to popular belief, a high-resolution display doesn’t make lower-res files look good. It needs to be fed content at its native resolution for best results, which in this case is 4K. Currently, there isn’t enough 4K content available through DTH or even via online services, but that may change completely in a year’s time. And that is when one will realise the full potential of this TV. Having said that, the picture quality isn’t perfect even when playing 4K videos. The colour reproduction is good and colours feel natural in most cases, but the contrast is a bit dodgy, especially in darker areas. It tends to make the darker areas a bit too dark, thus losing finer details in those areas. I cannot pinpoint if it’s the panel or the aggressive processing algorithm that causes this, but there is nothing you can do to remedy it. Also, you do not have the good old picture adjustments like colour, contrast etc, which is surprising. Moving on, the audio output is pretty strong on this one. It has a pair of integrated stereo speakers that deliver a total output of 20 W RMS. ‘20 Watts’ seems like standard fare for most TVs these days, but the sound output that this Onida TV delivers is a lot more powerful than most TVs who flaunt that number. Even at 25 percent of the volume level, it is pretty loud. Though you do not get a thumping bass here, rest of the frequencies are reproduced well. A special mention for vocals, which are delivered loud and clear. Video file format support through USB is excellent. It played practically every file I threw at it without a hiccup through its default player, including H.265 encoded files and high bit-rate 4K videos. That was somewhat expected given its more than decent processing hardware. And if you ever encounter some file it cannot play, you can always install a different video player through the Play store and play it. Speaking of apps, while there are millions of them at your disposal on the Play store, one of the most popular ones, Netflix, simply doesn’t work on this TV. It straight away throws an error to the effect of this device not being compatible. A simple workaround is to install the Netflix app on your phone and cast it to this TV. Chromecast built-in, remember? Other than that, Amazon Prime Videos app isn’t available at all for this TV. Maybe you can side-load it, but I didn’t get a chance to try it. Other streaming services like Hotstar, Sony LIV work flawlessly on this TV. A word on the user interface — it’s as smooth as they come; perks of pure Android (Google certified) TVs. The Onida 43UIC sports a simple design. It comes with metallic grey bezels around a slightly glossy screen. The bundled table stands bear the exact shade too. Though the company likes to term it as a ‘Brush Steel Finish’, it looks more plastic than metal. Thankfully, the top and side bezels are quite lean and do not attract unnecessary attention. The bottom bezel is noticeably thicker and bears the company logo, along with a standby LED and a prominent IR receiver. There is nothing bad about the design but this is not something that will warrant a second look either. 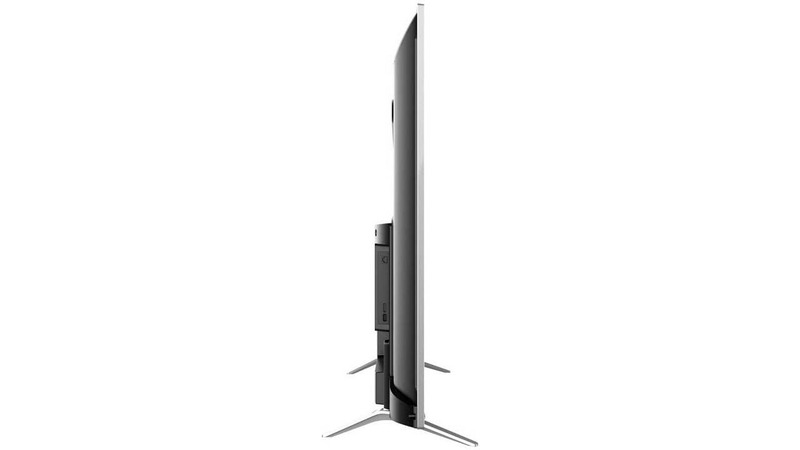 The TV can be wall-mounted or placed on a desk using the bundled stands. The pair of stands with a skid-proof base do a good job of holding the TV in place. However, there’s a slight wobble when you give the TV a push; nothing alarming though. A USB port, HDMI port and a LAN socket can be found on the left side of the TV, while all other input-output ports are located at the back facing the bottom, and they can be hard to reach if you opt to wall-mount this TV. That’s a strange design decision as there’s ample vacant real estate on the side panel to easily host a few more ports. As the model number suggests, this Onida 4K Smart TV sports a 43-inch display (42.5 inches to be exact) with a resolution of 3840 x 2160 pixels and a direct LED backlighting. You don’t get an IPS panel but the one here claims to display 1.07 billion colours with HDR 10 support for better contrast and details. The TV runs Android 8.0 Oreo with Google Play store and native app for YouTube and option to install lot more. The TV is powered by a quad-core processor with 2.5 GB RAM and 16 GB of internal storage, a chunk of which is taken up by the OS. A pair of stereo speakers rated at 10W RMS each take care of audio output. The Onida U43 UIC Smart TV comes with a clean Google interface. As I mentioned earlier, the TV comes with a built-in Chromecast. It lets you cast video from supported apps like YouTube, Hotstar, Sony LIV and many more. Casting is different from screen mirroring. In case of the latter, whatever you see on your phone screen is mirrored on the TV screen. However, if you were to mirror a video, you have to leave the phone screen on with the video playing. This consumes a lot of battery and you cannot do anything else with the phone as long as you choose to mirror the video. In case of casting, you can start the video in any app that supports casting, cast the video to the Chromecast on the TV and your phone is free for other use. Chromecast takes care of the video playback from there. The only thing you need to ensure is that your phone/tablet and TV are on the same Wi-Fi network. Onida has bundled a more than useful remote control with this TV. For starters, its build quality is excellent and feels premium. It has all the necessary controls for the TV along with dedicated keys to open the Google Play store and YouTube. The only thing missing here is an air mouse — not something I am too fond of anyway. However, the remote is voice-enabled, meaning you can use voice commands in certain Google apps, but the experience is patchy at best. The Google Assistant on the TV works reasonably well in YouTube or Google Search, but isn’t as polished as the one in your phone. It can be a complete hit or miss when searching for an app on the Play store. To give a voice command, you need to keep the microphone button on the remote pressed instead of saying OK Google to trigger it. It also claims to let you control smart devices in your home like smart lighting using voice commands. I couldn’t try that out as I did not have the requisite smart devices at the place where I tested the TV. 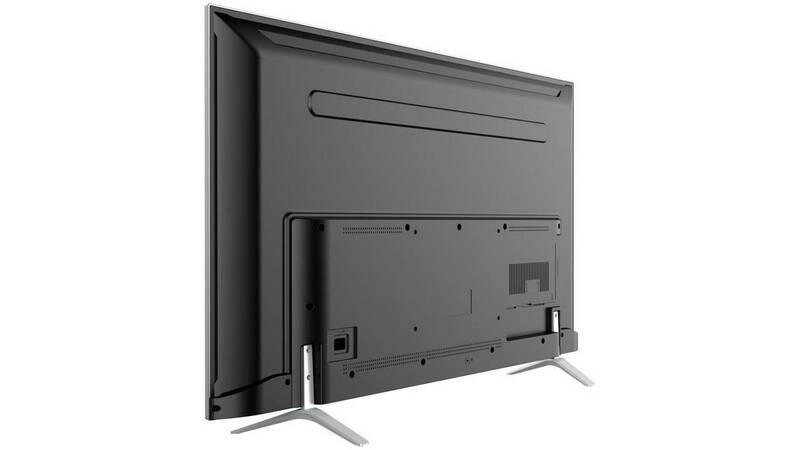 There are a fair amount of wired and wireless connectivity options that you get with this TV. The key ones being 3x HDMI ports, 2x USB ports, one RJ45 LAN port, one A/V in, a stereo out and an optical audio out too. Like all smart TVs, the Onida 43UIC has built-in Wi-Fi and supports 802.11 a/g/n/ac standards. The TV also lets you connect Bluetooth devices like headphones and game controllers. That’s a useful feature to have and one that not many smart TVs boast of. This TV can also playback 4K videos through its USB port. More on that a little later. The Onida 43UIC Google certified 4K Smart TV can be purchased for Rs 35,999 on Flipkart with a one year warranty. While the price is not bad for what you get, Onida will need to get a bit more aggressive with the pricing to take on the competition. A similar 43-inch certified Android TV from VU with a 4K display sells for Rs 29,999 and its 49-inch variant for just a thousand Rupees higher than this Onida. On top of that, both the VU models have IPS panels. All said and done, the Onida 43UIC is a good product overall, for all the features it offers, its performance and a smooth and clean UI. It wouldn’t be a bad buy at all for 10-15 percent lower than its current asking price. 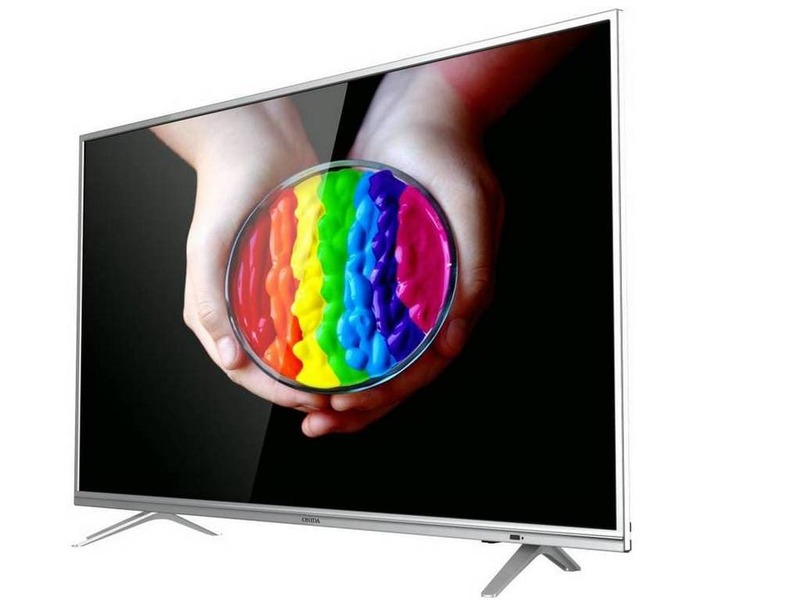 This Onida 43 inch UHD TV has output of 20 watts with PIE technology. It has resolution of 3840 x 2160 pixels and multi core processor. This TV also has smart tv, RJ45-port, wi-fi, android operating system, 2.5GB RAM with 16GB ROM also it has chatBot - voice control remote, millions of google apps and endless gaming possibilities.